For more than 200 years, the Roman Empire was a superpower that brought peace and prosperity to the world. That accomplishment alone makes it an important model. Some people assume that we are immune to any lessons from the Roman Empire because of our science, technology, and global economy. That theory is nonsense, as we saw in the lessons of World War I. The Romans did not possess atomic weapons, but the Roman army itself was a formidable weapon of mass destruction. The wrath of the Romans often meant ethnic cleansing. We have a global economy and an information superhighway, but the Roman economy was also global. Traders traveled across the empire, and there was economic unity all the way to China. In modern times, our advanced technology does not prevent human suffering. Fears declares a fundamental lesson of history is that human nature never changes. Since the Roman Empire collapsed in the 4th and 5th centuries A.D., thinkers have tried to understand its decline and fall. However, Rome is testimony to his lesson that empires rise and fall because of specific decisions by individual leaders. Given that human nature never changes, the same mistakes are made again and again throughout history. The Roman Empire ultimately fell because its leaders failed to solve critical foreign-policy issues in central Europe and the Middle East. Fears points out that Rome first intervened in the Middle East in the 2nd century B.C. The Caesars tried military intervention, nation building—reconstruction on the basis of Roman political values—and occupation, but nothing brought true peace. This was because of the Roman encounters with Judea (Israel) and the Iranian Empire (Iran) that stretch through today's Afghanistan, Tajikistan, Uzbekistan, Turkmenistan, and Kazakhstan. In the 2nd century A.D., the empire still held together, although the problem of the Middle East remained. Marcus Aurelius sought to conquer Iran one more time, but his troops brought back a plague that devastated the empire, weakening its manpower for generation to come. In the 3rd century A.D., the Parthians (Iranians) were overthrown, and a new native Persian dynasty, the Sassanid, took power. They ravaged the Roman Empire in the east, while new coalitions of Germanic tribes swept into the empire in the north. Rome beat back these attacks on two fronts, but the empire that emerged was fundamentally changed. The army became bloated and inefficient. Taxes on the middle class were onerous. The bureaucracy became a huge, swollen fore. Above all, the sense of loyalty to Rome disappeared. Many citizens stopped supporting the empire. In the 5th and 6th centuries A.D., German princes dwelled in the ruined palaces of the Caesars in Italy. In the east, under the banners of Islam in the 7th century, Syria, Egypt, and North Africa influences of Rome were swept away. The Roman Empire became a relic. In his Preface Sowell sets out his proposition by stating that the views of political commentators or writers on social issues often range across a wide spectrum, but their positions on these issues are seldom random. If they are liberal, conservative, or radical on foreign policy, they are likely to be the same on crime, abortion, or education. There is usually a coherence to their beliefs, based on a particular set of underlying assumptions about the world—a certain vision of reality. House Speaker Nancy Pelosi called the border wall an immorality. NPR's Michel Martin speaks with Dr. Robert Jeffress, American Southern Baptist pastor, who takes the opposite view. We are going to go back to a question that consumed the U.S. government, in fact, led to a partial shutdown of the government last month, the question of additional physical barriers along the U.S.-Mexico border. There already are some barriers, as you probably know, but the argument is over whether additional ones would actually make a difference or are worth the cost. As you probably also know, President Trump has made this a high priority. But we've been asking a different question. Is it moral? House Speaker Nancy Pelosi, among other Democrats and some activists, have laid down a very specific marker on the wall, calling it an immorality. Last week, we heard from Shaun Casey, a theologian and former State Department official who's written widely about the intersection of faith and politics. He's currently at Georgetown University. This week, we are hearing another prominent thinker from a different perspective, the Reverend Robert Jeffress. He's pastor of First Baptist Church of Dallas, Texas. He's one of President Trump's closest evangelical advisors. For example, he offered prayers at the opening of the U.S. embassy in Jerusalem. And he is with us now on the line from his church in Dallas. Pastor Jeffress, thank you so much for talking with us once again. ROBERT JEFFRESS: Great to be back with you, Michel. MARTIN: So Speaker Pelosi might be the most high-profile person to make the argument that the wall is immoral, but she's not the only one. I take it you disagree. JEFFRESS: Well, I do. And, look, I mean, to say that a wall is immoral or, as the pope said earlier this year, unchristian, I think is beyond reason. Walls are not moral or immoral in and of themselves. It depends on the purpose for which they're being used. And for government to use a barrier to protect its security and its sovereignty I believe is in keeping with what the Bible says, is the God-given purpose of government, you know? I preach the sermon on Inauguration Day for President Trump and his family. And I told the Old Testament story of Nehemiah, whom God ordered to build a wall around Jerusalem to protect the citizens. And, as an aside, I said Mr. President, God is not against walls. MARTIN: There are other texts, though, in the Bible that bring down walls that are also quite well-known. I mean, and the holy texts of the Judeo-Christian ethic are also very clear about the need to offer welcome to the stranger, to protect the vulnerable. Is there a biblical warrant for a wall in your view? JEFFRESS: Absolutely. And when God told the Israelites to be kind to, take care of the aliens and the foreigners in your land - but he goes on to say the reason for that. He said to Israel because you were once aliens and foreigners in Egypt. And that's the key, Michel, to understanding what the Bible is saying. Israel came to Egypt as welcomed guests, not as illegal immigrants. They were invited to come. Pharaoh invited Jacob and his family to come and settle there. And I believe America is the kindest most compassionate nation in the world to those who come into our country, legally. But there is no biblical basis for illegal immigration. MARTIN: For those who take a different view, I don't know that it's so much a question of the wall itself is that what is the duty to people who are fleeing oppression and suffering. And that I think they consider to be the higher duty than maintaining this physical barrier to keep people out. So how do you understand that? JEFFRESS: Well, again, I think we need to be sympathetic toward those who are fleeing oppression. I think, as a practical basis, there is probably a limit to how many people America can take. But I think government has to balance that call for compassion with the call for protection. And so I think government has to do a balancing act here. And, you know, I know somewhat of the heart of this president. I don't believe he's a mean-spirited man. I believe him to be very compassionate. I've sat in the Oval Office with him and heard him agonize over the DACA situation, wanting to help the DREAMers, in fact, wanting to do much more than the Republican establishment wanted to do. MARTIN: And before we let you go, let's just go back again to something you referenced early, which is what do you think your role in this is. I know that you're a very strong supporter of the present. You just tweeted just a few - just a little while ago, thank God for this president. Your specific concern that you were referencing was abortion policy in this country. So I know that you're a strong supporter of him. But what do you think your role in this debate is? JEFFRESS: I believe my job as a preacher of God's word is to speak to what God's word says about every issue, including immigration. And I think people need to understand that God has created the church for one purpose. He created the family for another. But the third institution he created was government, and government's distinct responsibility is to maintain order and protect its citizens. And I think it's wrong to vilify President Trump or any government official who's trying to fulfill that God-given and unique responsibility of government. MARTIN: Well, but you disagree with other political leaders. I mean, there are other political leaders who you don't think are doing their job to protect the public. And, I mean, if supporting government in all of its decisions was biblical, then there wouldn't have been an American revolution, would there? JEFFRESS: Oh, I don't support government and all of its decisions. I think, for example, New York state, Virginia - their late-term abortion bills are barbaric and ought to be opposed at every level. I think Roe v. Wade is barbaric and ought to be opposed. I don't have any trouble calling out government when they're wrong. MARTIN: That is Dr. Robert Jeffress. He is the pastor of First Baptist Church of Dallas, and we reached him at his office there. Pastor Jeffress, thanks so much for talking to us. JEFFRESS: Always good to be with you, Michel. Thank you. Sowell claims that the analysis that follows is not only an examination of the vision of this elite intelligentsia and their numerous followers in the political arena and in the courtrooms, but is also an empirical comparison between the promise benefits of policies based on that vision and the grim and often bitter consequences of those political and judicial decisions. In short, the purpose is not simply to see what kind of world exists inside the minds of a self-anointed elite, but to see how that world affects the world of reality in terms as concrete as crime, family disintegration, and other crucial social phenomena of our times. The immediacy of the issues involved only makes it more imperative to understand the past from which they came and the future toward which they lead. However, the historical roots of the currently prevailing vision go back much further, in some cases for centuries. Both the past and the present musts be explored, in order to understand the vision of the anointed and its dangerous legacy for the future. Sowell posits that dangers to a society may be mortal without being immediate. One such danger is the prevailing social vision of our time—and the dogmatism with which the ideas assumptions, and attitudes behind that vision are held. It is not that these views are especially evil or especially erroneous. Human beings have been making mistakes and committing sins as long as there have been human beings. The great catastrophes of history have usually involved much more than that. Typically, there has been an additional and crucial ingredient—some method by which feedback from reality has been prevented, so that a dangerous course of action could be blindly continued to a fatal conclusion. Much of the continent of Europe was devastated in World War II because the totalitarian regime of the Nazis did not permit those who foresaw the self-destructive consequences of Hitler's policies to alter, or even to influence, those policies. In earlier eras as well, many individuals foresaw the self-destruction of their own civilizations, from the days of the Roman Empire to the eras of the Spanish, Ottoman, and other empires. Yet that alone was not enough to change the course that was leading to ruin. Today, despite free speech and the mass media, the prevailing social vision is dangerously close to sealing itself off from any discordant feedback from reality. Here & Now's Jeremy Hobson talks with Larry Summers (@LHSummers), former secretary of the Treasury and president emeritus of Harvard University, about interest rates, tax rates and other economic issues. "The risks of a near-term increase in rates are substantially greater than any potential benefits. Inflation appears to be quite quiescent with inflation expectations declining. There's evidence that the economy is slowing. So in a situation of that kind, why do you want to hit the brakes? The vehicle is if anything at more risk of slowing down too much than of accelerating too much, and it's very important to remember in thinking about monetary policy that it operates with a substantial lag. And so the effects of policy on the economy over the next six months are not going to be the policies that are pursued in the next six months, they're going to be the lagged effects of the policies that have been pursued over the last year. "So I think the Fed, perhaps belatedly, has come to the view that there's really not a case for raising rates. 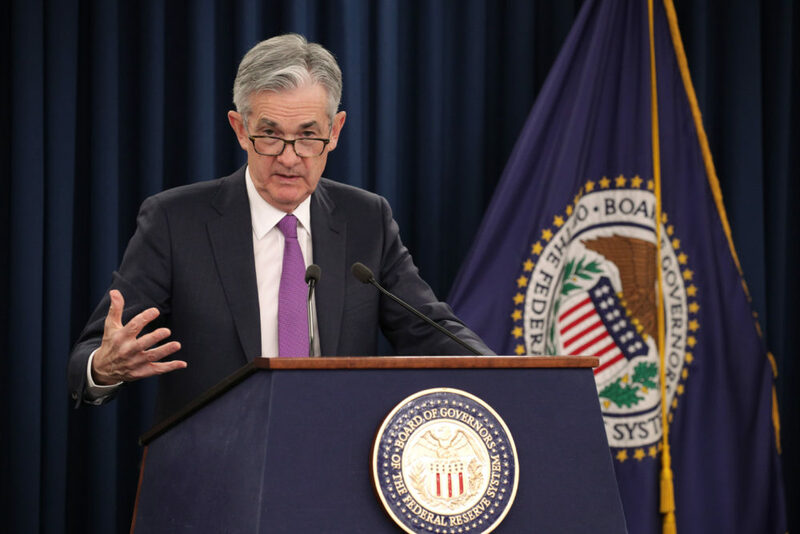 They've embraced the view that the kind of normal real interest rate at which the economy will move forward at a reasonable pace, which used to be quite fast, has slowed down considerably." "I don't see any evidence that this is a response to White House pressure. It seems to me that if you listen to the economic commentariat, they mostly have been calling for moves of this kind. If you look at what the market's been saying, the market has been signaling a desire for an adjustment of this kind. So I see no reason to think that you have to look to White House political pressure to explain." "It's very hard to predict recessions, and usually when we have recessions, we don't succeed in predicting them in advance. I think the risks of the economy going into recession this year are not that high, perhaps 15 percent. I think the risks of the economy going into recession by the end of next year are approaching 50 percent. I think the things to look for are what are markets pricing our markets anticipating that the Fed will have to ease our markets seeing big increases in credit spreads our stock prices declining. I think those are all important indicators for judging the likelihood of recession if a recession comes. I think it's most likely to be because of a spontaneous downdraft in markets or it's likely to be because of the uncertainties associated with the global economy and the geopolitical overlay." "She is right. The congresswoman is completely right to emphasize the importance of progressivity, and to emphasize the importance of taking much more from the very top group in our population. I think though the place that policy should start is with base broadening and better enforcement. The fact that compliance audit rates for the richest people have gone way down is a scandal. The fact that tax shelters have been allowed to proliferate, and in some ways were magnified by the recent tax cut, is just wrong. So I think you can raise substantial revenue — more revenue in fact than the 70-percent plan would raise — with base broadening in areas like capital gains, in areas like better enforcement on estates. That's where I'd rather see policy begin." "There is a lot of room for making the system both more efficient and more fair by broadening the tax base, and that's the better way to go at raising revenue from people with high incomes." Many of these “thinking people” could more accurately be characterized as articulate people, as people whose verbal nimbleness can elude both evidence and logic. This can be a fatal taken, when it supplies the crucial insulation from reality behind many historic catastrophes. Despite the power of the prevailing vision, some have escaped its gravitational pull. Indeed most of the leading contemporary opponents of the prevailing [liberal vision] were themselves formerly within its orbit. Milton Friedman, Friedrich Hayek, Karl Popper, Edward Banfield, Irving Kristol, Norman Podhoretz—the list goes on and on—once shared may of the assumptions of those with whom they came ultimately to differ so fundamentally. Even in the realm of practical politics, the most prominent and most successful opponent of the prevailing vision, Ronald Reagan, was once so much a part of it that he belonged to the liberal organization Americans for Democratic Action. In short, few have spent their entire lives outside the vision of the anointed, and virtually no one has been unaffected by it. Understanding that vision, its current impact and its future dangers, is the purpose of the Vision Of The Anointed. According to Rufus J. Fears, America in the 21st century looks like Rome in the 1st century BC. And our end will be like Rome of the 4th century AD, all because the Empire was bogged down in the Middle East. Thereby entanglement in the Middle East helped bring the Roman Empire to an end. It was a classic example of Imperial Overreach. Our end is written in history, but history means nothing to a people that does not take lessons from it.